Friday, 12 April 2019 - 10:27 am. • Left – White Toyota Hilux H74QG stolen from Smithton between 9 and 10 April. Police reference number 611031. 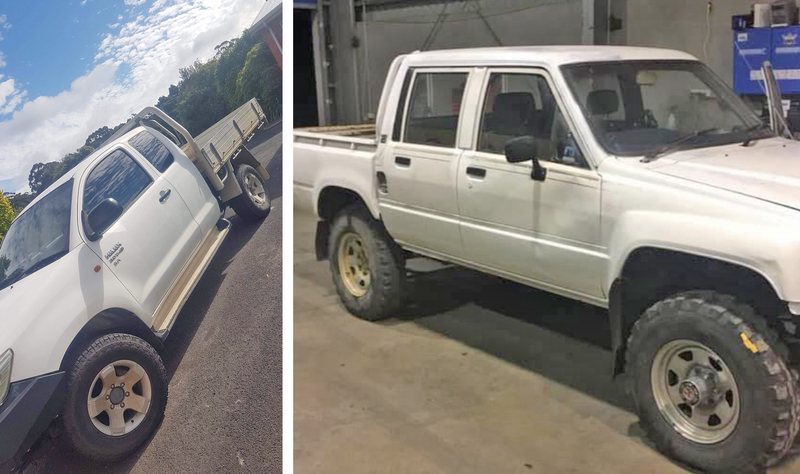 • Right: White Toyota Hilux CB5422 stolen from Wynyard between 5 and 8 April. Police reference number 610926. Anyone with information in relation to either stolen vehicle is asked to contact Tasmania Police on 131 444 or Crime Stoppers anonymously on 1800 333 000 – quoting the police reference number above. This page -- https://www.police.tas.gov.au/news/western-crime-stoppers-assistance-required-12-april-2019/ -- was last published on April 12, 2019 by the Department of Police, Fire and Emergency Management.